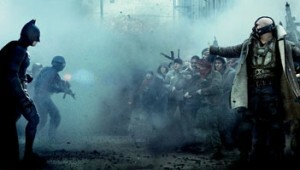 The Dark Knight Rises is bigger, louder, and does not disappoint. It makes both The Dark Knight and Avengers look like microfilms, and if you thought that The Dark Knight took Batman a little too seriously, well… you’d better stay away because this barely counts as a superhero movie. The movie begins 8 years after Batman took the fall for Harvey’s murders, with Gordon giving a speech on the death of Harvey Dent and how Harvey saved his life. Nolan quickly ties things together between this and the last movie and immediately follows with a scene that in my opinion tops the opening scene of The Dark Knight. We are introduced to Batman’s newest villain Bane, and with the introduction of Bane Nolan does the impossible; he makes a villain more threatening than his Joker. While the Joker can be compared to a mad dog that doesn’t give up, Bane is more a crocodile that is perfectly still, waiting for the perfect time to strike (And Catwoman can be compared to a cat. Oh what wisdom!). Anyone who lives on Mars and hasn’t seen any trailers for the movie might not know who Anne Hathaway’s character is in the movie, but everyone else will know that she plays Catwoman. And with that piece of information Nolan creates a little dramatic irony when Selina Kyle (Catwoman) is first shown as a maid in Bruce Wayne’s home and introduces herself to a crippled and older Bruce Wayne. I’d like to stop talking about the plot now because I’ve covered the introduction of the three main players of Nolan’s grandiose finale and believe that any more information about the film can only hurt your level of enjoyment from all the surprises Chris, John, and David have written. I am a fan of Nolan. Memento is a storytelling masterpiece and Following is a great debut film, especially when you account for how low the budget was. I’ve always enjoyed his Batman films but I’ve also been a tad disappointed with his attempts to bring Batman into the real world. A problem I had with The Dark Knight was how hard he tried grounding it in reality yet created an opening scene that is just completely absurd (as cool as it was) and continued to have scenes that took me out of the film because in real life they wouldn’t happen. Well as I mentioned earlier, The Dark Knight Rises can barely count as a superhero movie and for what Nolan is trying to do, that’s a good thing. He has finally managed to make a Batman movie that is almost entirely grounded in reality (aside from that big freaking ship he flies around in the whole movie but hey, he’s Batman). 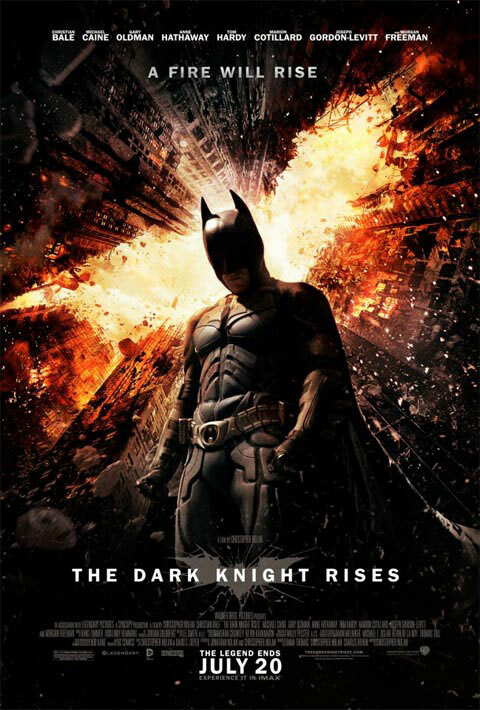 The Dark Knight Rises opens in theaters everywhere tomorrow. Solid review! I liked your perspective and comparison on Bane and Joker quiet a lot. Keep up the great work!